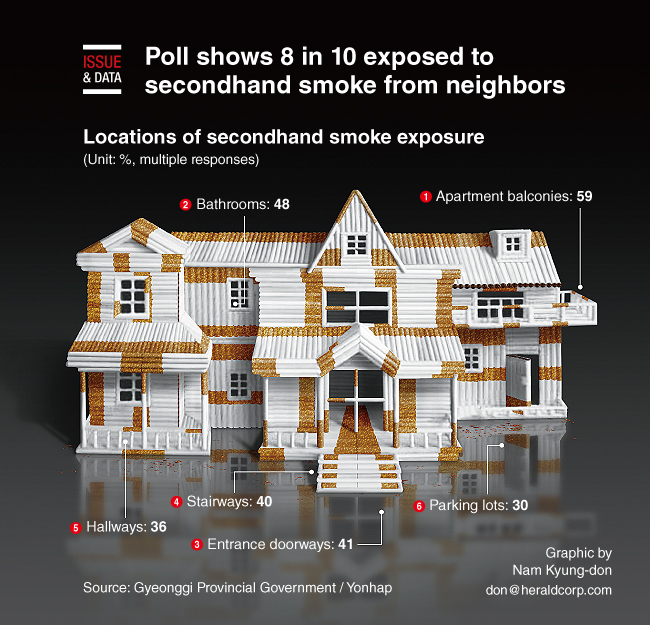 As many as 8 in 10 South Koreans have experienced exposure to secondhand smoke from neighbors, but most refrained from complaining, a poll showed. The survey of 1,542 residents of Gyeonggi Province -- the nation’s most populous province, which surrounds Seoul -- found that 1,197 respondents, or 78 percent, had been subjected to harm as a result of smoking by their neighbors. The poll was conducted by the Gyeonggi Provincial Government from Dec. 21-27 last year on its online site. Seventy-four percent of those who had experienced passive smoking described the harm as “serious,” whereas 26 percent dismissed it as minor.